Every morning, there is almost a ritual gong that sounds off in the halls of humanity. It cries out to every seeming grown adult in our society, no matter what creed, income or status. Oh yes, the ritual began in earnest in the mid 1900's, as commercialism spread far and wide, and ceased opportunities for money making advancements in the art of edible consumptions. But. Why is it we attach to coffee so quickly and readily in the morning? What is it about this ritual that leaves us wanting more each and every morning? To understand this, you must understand what happens every night when you sleep - you see, the body, when not being fed or given liquids, undergoes what is a cleaning process, sweeping and removing junk from the system - the residues from eating and movement or lack there-of, during the previous day. It assimilates, and attempts to sweep and scrape and eliminate all the residues that are left behind from such activities. Unfortunately, when you rise, depending upon how clean your diet was and has been habitually, your system is quite overburdened and, say, waterlogged. Or should I say, MUCUS logged? Yes. That familiar coughing or throat-clearing in the morning; the swollen face, puffy eyes, and sinus being filled with mucus or snot. Yes. That. That is your body trying to coat the residues and poisons from the things you ingested, and coat them with a thick mucusy substance to attempt to neutralize it and activate it and move it out of your body systems. This is also why you feel groggy in the morning. This is a sure indicator you have been eating the WRONG things, and / or your body system is trying to clean out decades worth of junk layers being stored in your system, and thusly making it run highly inefficiently. So why this coffee? What's going on there? How does it fit in? Well. Simple as this: you feel miserable when you wake. Groggy. Cranky. Ornery. You want somethign soothing. Warm liquids is soothing. And coffee, is the warm liquid of choice, simple as that. Socially condoned. And highly addictive. The acidity matches the acids trying to leave the system, and also gives your adrenal system a forced push from the caffeination. 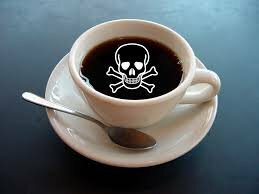 The acids from the coffee actually immediately begins to SHUT DOWN your body's cleaning processes and systems. This is not good. It's only delaying the inevitable NEED of pushing out these poisons from your body. So yes. Sure. Reach for that coffee. It's soothing, warm, and stops all the pain of the processes of your body pushing out the junk from poor and unrecognized poor choices in living and lifestyle. It also appears to loosen the junk that has been stirred up, but I assure you, that's just due to it being hot liquid. Try instead a warm cup of water with lemon. That'll be an astringent and thin out the mucus. Proven to do so. And, won't stop or shut down your body's desperate need and desire to clean out.